Cosco CET-JK-2125 Elliptical Cross Trainer is a residential elliptical trainer with magnetic brake. It has heavy guage, magnetic brake speed control, hand pulse and Large LCD display. 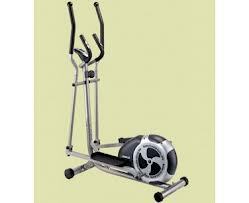 This cross trainer comes with some efficient features which are normally present in expensive ellipticals. Heavy gauge, precisely engineered magnetic brake speed control 250mm flywheel. 3 pc crank with bearing for smooth operation. Net Weight : 42.7 Kgs. *Note: Most of the sites, stores or shopping portals listed above sell Cosco CET-JK-2125 Elliptical Cross Trainer with discounts and other exciting offers. There is a possibility that the some of above websites are not selling Cosco CET-JK-2125 Elliptical Cross Trainer now. Toughtrain.com is not liable for such cases or instances. Also we do not recommend any seller for Cosco CET-JK-2125 Elliptical Cross Trainer and a buyer should buy from where he/she gets best deal with quality of products, service and on time delivery (shipment).